Tubey Toys Review: HUGE Give Away Featuring the Coolest Toys of 2019! Check it out! Enter to win! HUGE Give Away Featuring the Coolest Toys of 2019! Check it out! Enter to win! Let’s kick off 2019 with an epic give away by Tubey Toys Review and The Toy Crazy Show! One winner will win one prize pack with all of the toys below—at a $150+ value!! To enter, click the link in either of our bios and enter via gleam. The more times you enter, the more it will increase your chances of winning! Enter every day! Bonus entries include sharing our post on social media, tagging friends, commenting on our videos, and more! 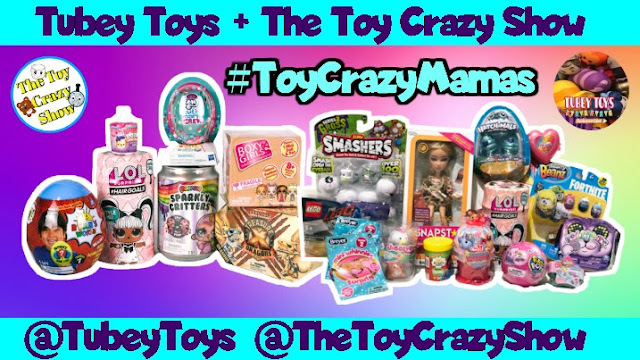 Always use #ToyCrazyMamas Entering via gleam will automate all of your entries! Any entries you think may not have been tallied, please DM ONE of us. Please only DM us regarding an issue with an entry. LOTS OF LUCK! Make sure you read all of the rules before entering. And always enter via the gleam link. :) Good luck all! Wanting to always looking for the best toys, you make it east to buy for my great granddaughters. Thank you for this wonderful offer. Thanks for the chances to win such great stuff! Thanks for the chance! We love toys!